Retail for $6US or $8.99CAN at Walmart. These are liquid/cream eyeshadows with a metallic finish. 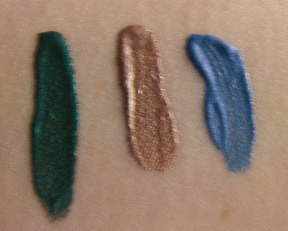 Product: 5 new "Metal" shades Which are mush more metallic then shimmer in nature. The only one I struggled with was 75 Electric Blue as it was so fined milled the brush would not pick up the product as thickly so it applies sheer but it's very buildable. 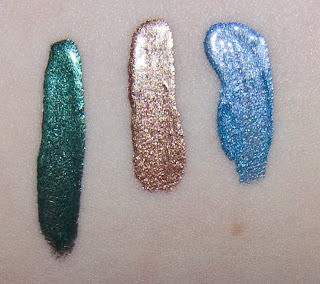 Wear: with and without a primer these only last 4 hours on me before notice flaking of the shadow occurred in the crease. And I do mean flaking as chunks of it where missing rather then gradual fading. Packaging: Plastic test tube style packaging with a doe foot applicator. If you have hooded lids or a folded crease avoid these as the flake and roll off with any folded skin. The work find on others that use a good primer. Yaby Cosmetics Annual Sale 2012!